Cristiano Gatto began his creative life as a sculptor, studying at the School of Fine Arts in Venice. 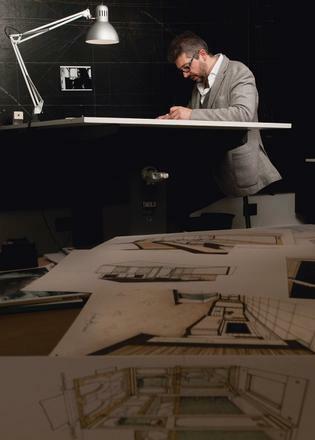 He soon developed an interest in the relationship between industrial design and contemporary art and, after cutting his teeth at the renowned design studio of Nuvolari Lenard as head of the interior design department and latterly the general manager, Gatto formed Cristiano Gatto Design in 2001. From a studio in Preganziol near Venice, Gatto and his design team work on both interior and exterior design schemes for superyachts, interior schemes for residential and hospitality projects, in addition to furniture design. Some of the studio’s largest superyacht projects to date include the interior design of the 80 metre YachtleyElements, the 50 metre HeesenHome and the 62.5 metre Maidelle built by Icon Yachts, now known as Party Girl. They have worked with other major shipyards in Europe and abroad, including ISA Yachts, Astondoa, Benetti, Leopard Yachts and Gulf Craft. As well as being a multi-faceted designer, Gatto draws on his past experiences as a widely exhibited sculptor. He attributes the reason he is sought after as a designer to his passion in this particular medium. 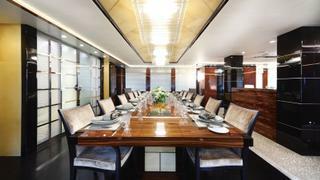 In the same way he once approached a sculptural project, he approaches a yacht interior, considering the smallest of details alongside the overall design. The Cristiano Gatto Design team is undoubtedly known for its attention to detail and use of materials, from precious veneers and marbles to unique fabrics. Its design offering includes creating bespoke furniture, door handles, cushions or carpets, to ensure a one-of-a-kind cohesive superyacht scheme. When I’m asked the difference between being an interior designer and a yacht designer, I say it is fundamentally that the thing we’re designing moves. 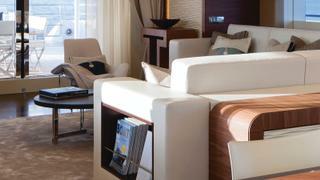 We need to choose the right furniture for the right space and we need to think about how we can fix it on board. Usually furniture is designed for a residential home, so the designer doesn’t need to take into account the vibrations of a boat. Then there is also the impact of humidity and salt water over time to consider. We have to think very carefully about what we put on board. We produce a lot of custom-made pieces that will work from a technical point of view. Sometimes space is limited, so we’ll think about storage solutions. On Amore Mio, we created a sofa that also acted as a bookcase, for instance. We’re often working with the suppliers to change the dimensions of pieces so they’ll work on board. Being in the business a long time and having the good fortune to live in Italy, we know a lot of the producers and we’re able to work with them to produce custom pieces. Some of the pieces of furniture that I love most in the world, I have still been unable to use in any projects – from 1993 to this day – and I’d love to. Every time I start a new project I think yes, this could be the one, but it never is. A design scheme is like a recipe: everything needs to be brought together and calibrated in a way that works and it’s not always easy. You can’t force a piece of furniture to work in the room just because you like it. I think using a bold, bespoke piece that stands out in the room is a very 1990s way of designing an interior and feels dated now. If you have a statement piece, it’s the object that attracts your attention more than the space, and the whole room should capture your attention, not just one piece. That’s not to say you can’t use unique pieces. On I Nova, the dining table is made out of kauri wood; it’s the rarest timber in the world, from trees in the far north of New Zealand that fell as a consequence of natural events between 30,000 to 50,000 years ago and have remained preserved under the mud all this time. It’s an amazing piece of furniture but it also blends with the entire cabin scheme; it shares a common language with the furniture around it. To go back to the recipe analogy, you don’t want to over-salt the recipe and ruin it. 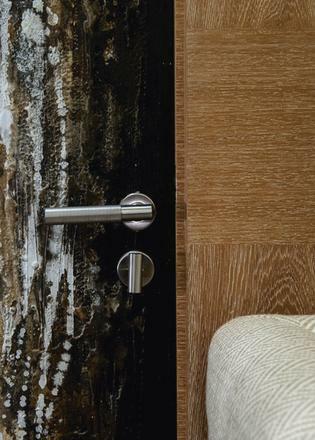 When I’m designing a piece of furniture, I care a lot about the materials that we use. A favourite piece was on Amore Mio, where we used five different materials on the same table: two types of leather, stainless steel, walnut and ebony. It was beautiful. We work with some wonderful suppliers. Baxter, for instance, is able to create leather the same thickness as saddle leather, but it’s super soft because it’s treated by hand for a week. For glass pieces, I use Carlo Moretti because it combines tradition and modernity at the same time, which I like. A lot of the companies I work with use age-old techniques but create contemporary styles. Every boat is completely different in its aesthetic, but you can’t go wrong with well-made modern pieces. 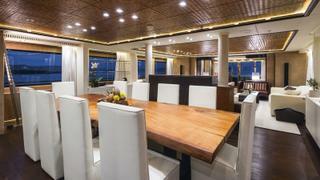 This article was originally published in the Superyacht Interiors book, order your copy here.